Top 3 tips: Make the most out of social media in your job hunt! It’s estimated that the average American spends “more than 11 hours per day watching, reading, listening to or simply interacting with media, according to a new study by market-research group Nielsen. That’s up from nine hours, 32 minutes just four years ago,” says an article from MarketWatch. We all have a favorite social media app that we probably spend too much time on-it’s the one that we automatically open on our phone when we wake up, while we wait in line at the grocery store or sometimes we even go to our favorite apps to escape an awkward social encounter. 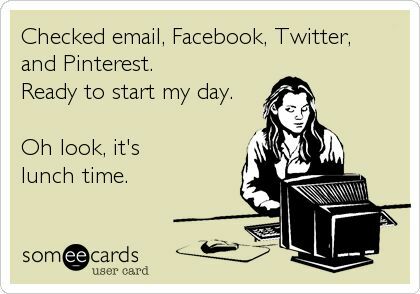 But social media isn’t just a great place to escape to, it is also a great way to find your next job! Here are some our top three tips to make the most of social media in your job hunt! If you already have a social media profile on sites like Facebook, Instagram, Twitter and LinkedIn-you’re off to a great start! But sometimes our personal profiles can be- well, a little too revealing. Your next employer probably shouldn’t see those partying pictures from the weekend and you never know what kind of things your friends might say or post on your profile. A great solution for this is to create a separate, professional account for each of the social media outlets you want to actively use for job hunting. That way you can set and control a specific image of your professional interests and experience. Many social media outlets require just an email and name to set up a new account. You can even set up a new email address that you can use only for your professional social accounts and correspondences. You can ramp up your profile by adding a clear, recent profile picture and updating your location and previous work experience, as well as double checking that all of your contact information is correct and up to date. LinkedIn for example, will walk you through all the areas on your profile where you can add information and then they even give your profile a “score” based on the amount of information you fill out! Most companies have a social media profile with at least one major network. Like, follow, or connect with the ones that you want to work for! These companies often post job openings and they are also often monitored by someone at the company, so it can be great way to get your name seen by someone already working there. It’s even a good idea to follow large companies that are related to your (work appropriate!) interests and hobbies. This can help employers see more of your personality and it also shows that you are involved beyond just applying for jobs. Take it a step further and comment on content and share posts from the companies you are most interested in! Companies are often alerted when someone interacts with them over social media- and you never know, they might reply to your comment or send you a message that could give you a more personal connection at their company! Social media makes it easy to one click apply at many places, but that doesn’t mean that you should assume that your application will be looked at. If you don’t hear anything back from the employer after applying through social media, it’s a great idea to follow up on your application by physically calling the employer or if you can, emailing someone who works there. Make sure that you are professional, concise, and never pestering! If you do not hear back after reaching out over the phone or email wait at least 3 days or even up to a week to reach out again. Did you know: we post many of our current job openings on our social media pages- everyday! We also post relevant articles, tips and tricks and the occasional cute animal picture? Follow us on Facebook, Instagram, Twitter and LinkedIn!